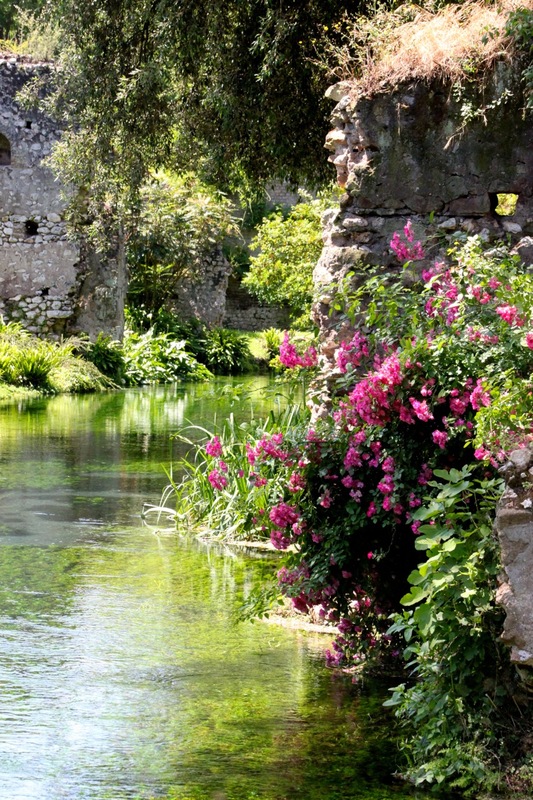 Monty Don introduced me to the Garden of Ninfa via his marvellous book ‘Great Gardens of Italy’. Ninfa is a wonderful romantic garden, built in the abandoned ruins of an ancient medieval town near Sermoneta, about 45 minutes outside of Rome. 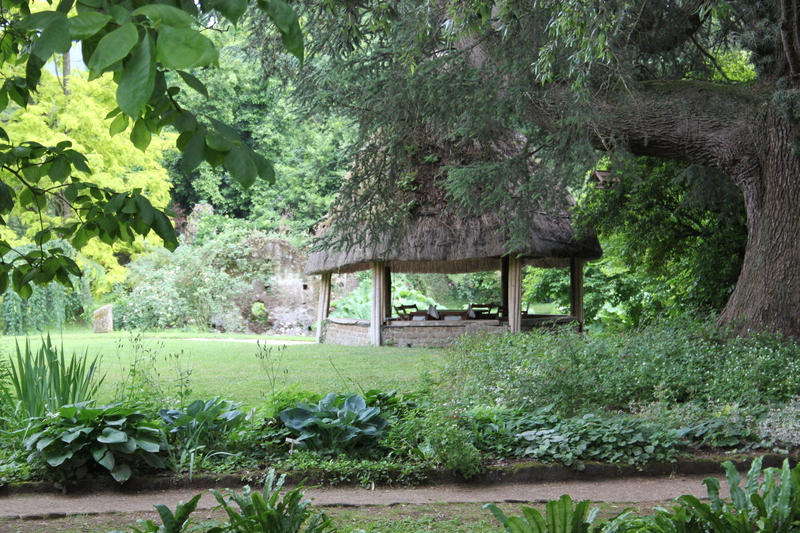 In order to protect the delicate balance of crumbling ruin and natural planting, Ninfa is rarely open to the public. Visiting and opening details are here on the translated Caetini Foundation website. Last year I mistimed a family trip to Italy and we missed the Ninfa opening weekend for July, I had not realised that Italian gardens do not open in the same way as English gardens. That year, I also led my family on foot in 40 degree heat across Rome to the Botanic gardens to find them shut as I had not checked the opening times. Thankfully I have an understanding family who do not moan and we just walked on to Trastevere and ice-cream. Ninfa also closes for a two hour lunch break, so timing is everything. We arrived before the Sunday morning opening of 9.00 a.m. All public visits are by guided tour only and the tour led by an English speaking guide was due to start at 10.00a.m. It had poured the day before, so waiting in the welcome Sunday sunshine was quite relaxing and just added to the excitement of visiting. We were joined by a couple from Australia and two ladies from America and had time to discuss Italian gardens and the best in show Australian Chelsea garden. Our very knowledgable tour guide led us all on the pre-planned route; there is no veering off and we were called back if we strayed or lingered too long in any one place. The tours are well timed so that groups do not see each other. My husband took notes for me and I tried to photograph as much as I could in a giddy frenzy. The bright sun was a mixed blessing as it was tricky to capture the colours of Ninfa. Ninfa is described as planted in the English Style. 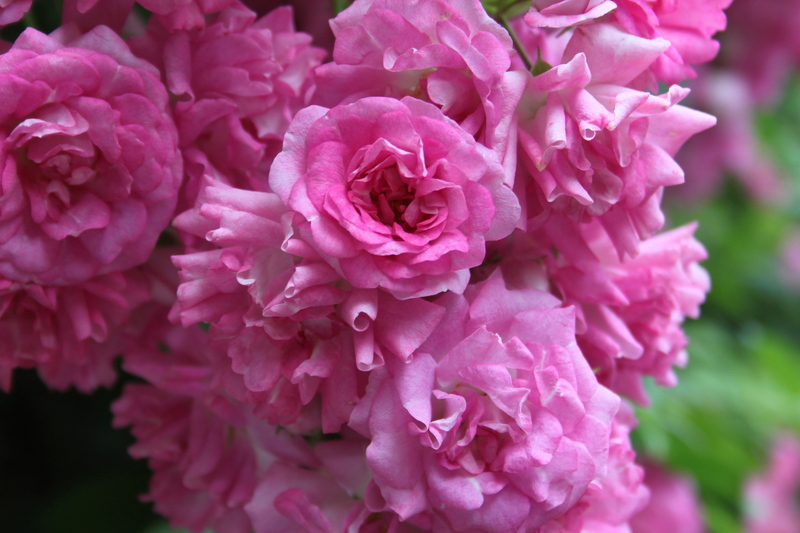 There are 160 cultivars of Roses that run through trees, climb the walls of ruins, are planted in isolation, planted within borders and are reflected in the water. There are 2000 other plant species brought together from all over the world and they thrive in Ninfa’s protected microclimate. I did not find the rose running through an Oak Tree that took Monty Don’s breath away in his inspiring TV series but I did fall in love with this evocative garden. At the end of our tour we went for lunch at the trattoria Ghost in nearby Sermoneta. The chef said lots in Italian, we nodded back and were served one of the nicest lunches we have ever eaten. Then drove back down the hill past the stunning wildflowers and went back to Ninfa. There wasn’t another English tour in the afternoon, so we joined an Italian spoken one. The second visit was even more magical. Another lady also photographing sighed and said “bella” many times. We just smiled at each other, we understood the emotion without the need for words. The bright sun was calmer and as we were the very last tour our guide was relaxed and let us linger a little longer. The late Spring meant we were lucky to see so many Roses still in flower, the sun shone and we were blessed to visit this most moving and romantic garden. We were very lucky to be there on a dry and sunny day, there was a lot of rain on our holiday! I’m glad you enjoyed your visit to Ninfa, magical is the only way to describe it. there is so much pure water that the garden is not really ‘Italian at all’! I was once there when there was a thunder storm everyone including the guide ran back for cover, a friend, my husband and I sheltered (hid) under a tree so that when the rain stopped after not very long (but we were drenched) we walked around the rest of the gardens alone – BLISS.. Christina PS I’m sure I’m being blind but where do I ‘follow’ your blog Julie? That sounds absolutely heavenly! I am not sure how to follow, I am on a steep learning curve here, but I think there is a tab at the bottom. I’ve not yet put (or asked my daughter) how to put a follow link on! Really lovely and interesting. Thank you, Julie. Thanks, Ninfa is truly beautiful and quite unique, I haven’t visited another garden like it. Ninfa was really beautiful and it was quite exciting to visit, I would really recommend going. Honestly, I am never disappointed to visit gardens abroad its refreshing. We do a lot of long borders over here and its good to see other styles. 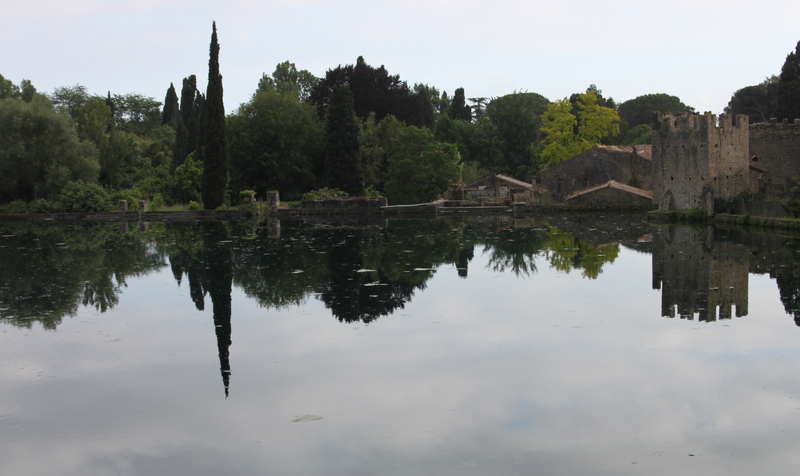 We have just returned from Italy and the Ninfa Gardens were the highlight of my trip. I did have a different experience in that on arrival I was amazed at the number of people waiting in the queues. Our tour guide spoke in Italian which unfortunately we didn’t understand but we were not directed to follow and wandered freely for some 2 hours and saw quite a few groups pass. I have taken so many photos and am now trying to sort them out. The gardens are absolutely magical and definitely worth the trip. I think you were very lucky to have wandered freely! Ninfa is a wonderful, I hope one day we get the opportunity to go back again. 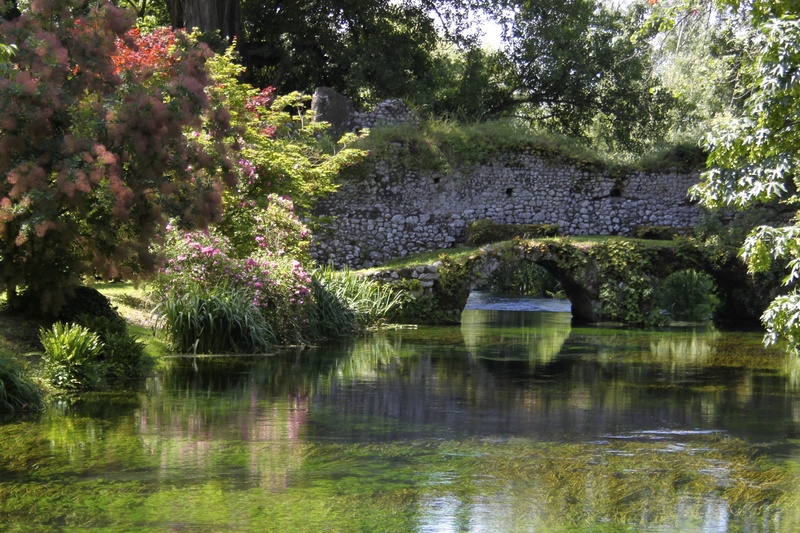 We are planning a trip for beginning of May 2015….any advice on the best way to see Ninfa Gardens…so excited to visit.I understand that the lineups can be horrendous. Should one arrange a tour ahead or just show up early & hope for the best? Go onto the Ninfa website for all of the latest information and email them directly for the best way to purchase advance tickets. We did and found them to be very helpful. The garden is only open rarely, so consequently maybe busy on each day it is open and I would plan to visit twice in one day or on consecutive days. The tours are guided and last about 2 hours, so not long in reality, we found visiting twice in one day really worthwhile. Enjoy! 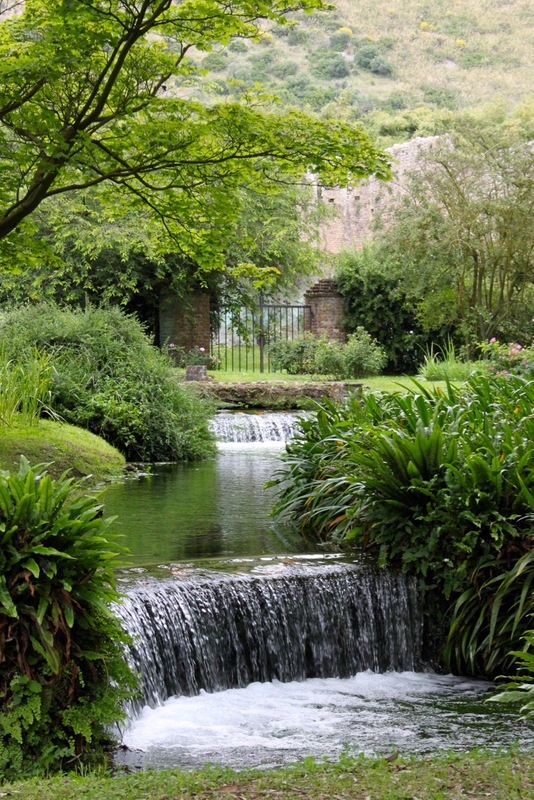 Julie, wanted to let you know that I have been in contact with the people for The Gardens of Ninfa. We would be able to join a group, likely with an Italian speaking guide or if we wish to pay € 50 each we could have a private tour…we would have an English speaking guide for the private tour and the tour would be on non public days…certainly something to consider. Thanks for your suggestion! Ooh that does sound good, I would recommend visiting the nearby village too as its so pretty and the drive up there affords some fantastic views. I know you will have a lovely time! Visiting Ninfa was really exciting, even my non gardening husband was excited. The garden is truly beautiful. Julie, I am very envious. I watched Monty Dons television programme that went with your book. Ninfa is one of THE gardens of the world. Your photos are wonderful. We visited Italy for the first time this year, it has been on the wish list for some time. We must do the gardens next. Hi Brian, check on Ninfa’s website for when you plan to go for opening times, I highly recommend a trip.It was one of the most exciting gardens I have ever visited. 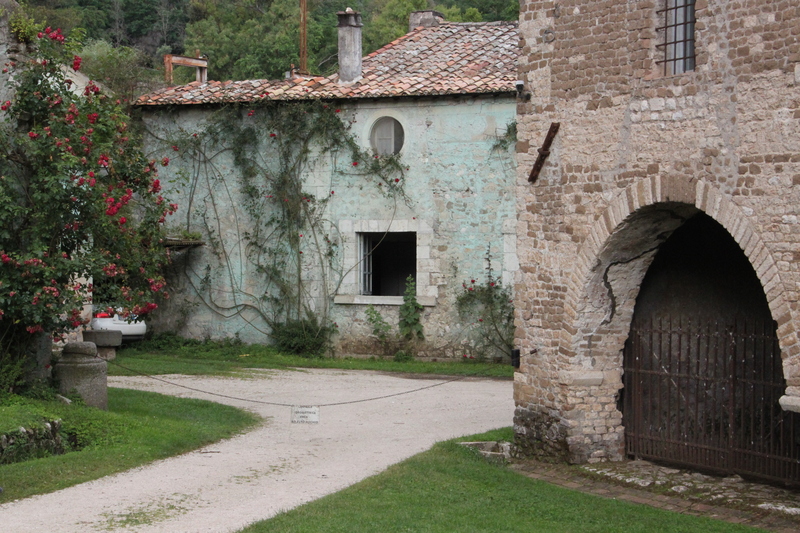 Italy has the most fantastic historic gardens and Monty Dons book was really helpful in planning. oh my goodness—my mouth is agape-LOL. Stunning! I watched the video and it is breathtaking…. Your photos were delightful-thank you for sharing. He also said about this garden-” when man in partnership works with nature it becomes enhancing”-boy ain’t that the truth! Thanks so much Robbie for going back to read this post, Ninfa was a really special place to visit. I really like that line too and yours! There are a few Monty Don Videos on you tube of his garden travels, all very inspiring. Well, I have to bike inside on my indoor bike during the winter, so I will check out his videos.I am so bored inside biking for exercise-outside so much better-gardening videos save me:-). Hi Julie, I was directed here from your “Reward” post and was glad I followed the link. Ninfa must be an incredible place. Your pictures and words describe such beauty. It was very exciting to finally visit Ninfa, and thrilling to discover how the garden was everything we imagined and a lot more too. Thank-you for directing me to this post of yours. Truly lovely photos! I do understand the problems of taking pictures in bright sunshine and also continental tour guides. I remember being shut into a church for an hour and a half tour in France and not being able to get out to the rest of my family! I hadn’t intended to do that at all! 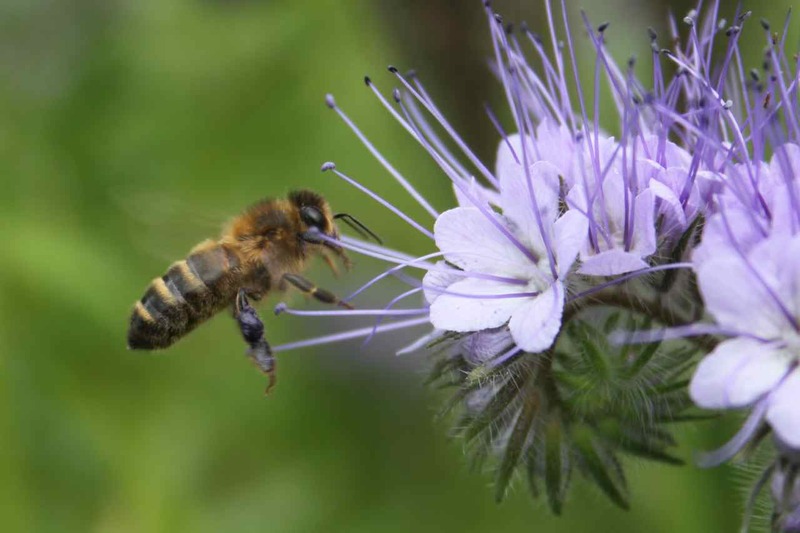 We were in Italy in 2013 too and noticed the late flowering of flowers and crops. Being shut in sounds terrible Clare, I hope the tour was at least some way enjoyable! We stayed initially in Amalfi where it rained most of the time, Versuvius was shut because of torrential rain and mainly we played a lot of scrabble, but finally visiting Ninfa was absolutely worth the journey. Thinking about being shut in now makes me laugh but at the time my youngest daughter was very small and was liable to make a lot of noise if she couldn’t see me and my husband could never calm her down. I was a little anxious so the tour wasn’t as pleasurable as it could have been. French tour guides go into such detail as well – each item is discussed at length and one is expected to ask questions too! Our Italian holiday was slightly later in the summer than yours and we were on the Tuscan coast. It wasn’t quite as wet but we had some amazing thunderstorms! I’m so glad you posted a link to this. I have never heard of Ninfa, but it does look like a magical place. 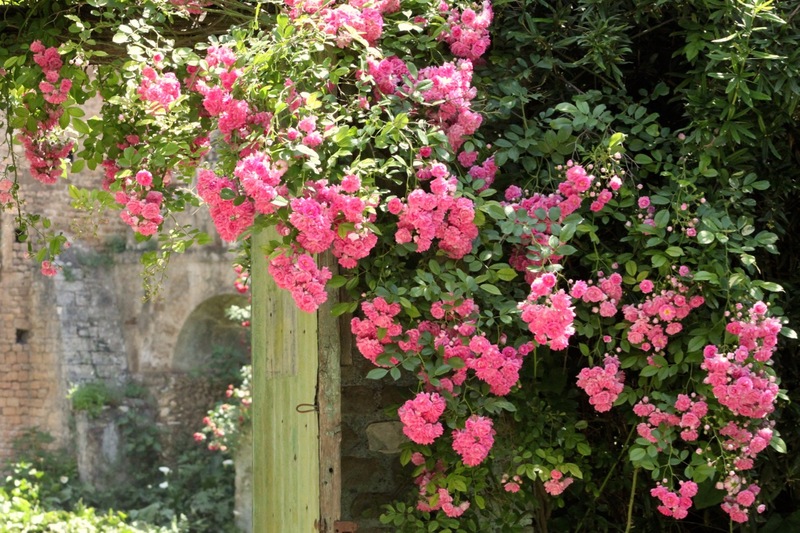 I love the unrestrained blooming roses and the old stonework mixed in with the garden. Beautiful pictures and garden. The garden has grown from the old ruins of a a town riddled with plague and malaria and then abandoned in the 12th century. The walls are the remains of once used buildings. 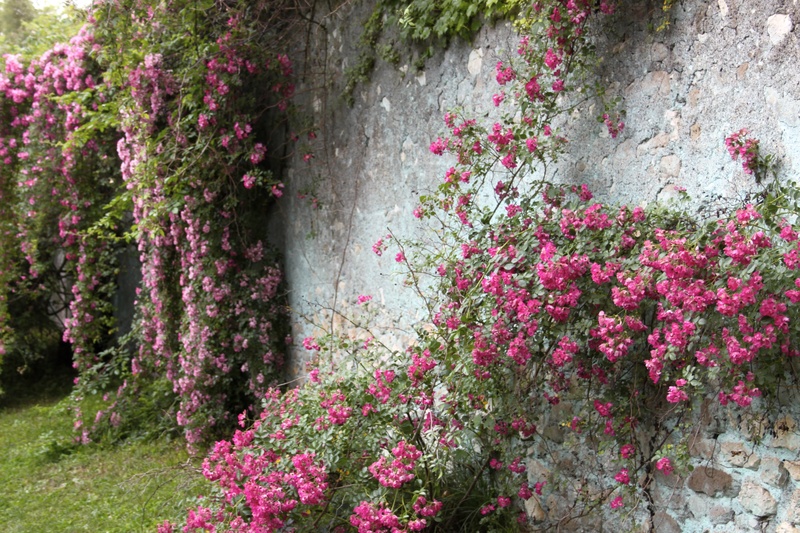 Many of the roses were planted in the middle of the 20th century when Ninfa was being transformed into a garden. Its an incredibly uplifting place to visit, if you ever get the chance I know you would love it. I remember seeing this on Monty Don’s Great Italian Garden series and it immediately took my heart. Your photos are magnificent – it’s definitely on my to do list when I get back to Europe! I have really enjoyed all of Monty Don’s garden visits. I would dearly like to visit China one day after watching his trip to the Yellow Mountains and the gardens of China and Japan. He has a way of getting to the very essence and spirit of a garden.